Kafka Streams provides so-called state stores, which can be used by stream processing applications to store and query data. Every stream task in a Kafka Streams application may embed one or more local state stores that can be accessed via APIs to store and query data required for processing. 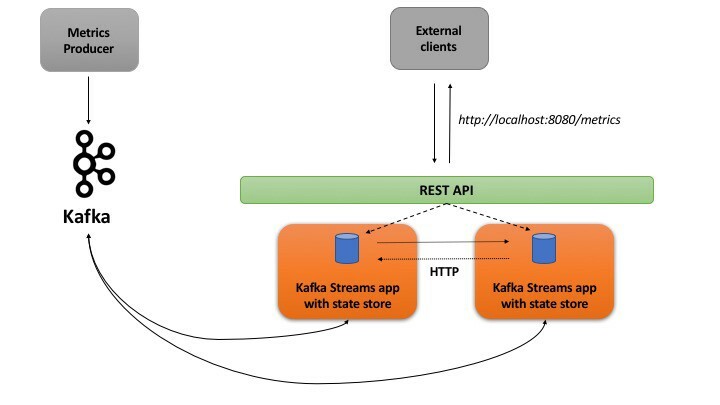 Kafka Streams offers fault-tolerance and automatic recovery for such local state stores. Kafka Streams enables your applications to be queryable. Interactive queries allow you to leverage the state of your application from outside your application. The full state of your application is typically split across many distributed instances of your application, and across many state stores that are managed locally by these application instances. But, how do the Docker containers communicate ? An external HTTP client (curl, browser etc.) should be able to reach the Docker container — this is achieved using a random port (e.g. 32679) using -P in docker run and the host IP (which is localhost if you’re not running Docker in VirtualBox or something which might be something like 192.168.99.100 in that case). This means you that the URL will look something like http://localhost:32769/metrics. Alright, this is simple enough ! Each Kafka Streams app accepts the RPC host and port in as a part of its configuration e.g. Notice the dockerDiscovery implementation which reads from the HOSTNAME environment variable inside the Docker container. As far as the port is concerned, this can be 8080 since thats what is defined in the code as well as the Dockerfile (using EXPOSE) — this is not a problem since this is inside the container. To put this all together, the Kafka Streams app config has a reachable endpoint e.g. 5691ab353dc4:8080 which the other instance(s) can invoke over HTTP to query for remote state store data. Don’t worry if all this does not sink in at once — the next section, where you will test the end to end scenario, will help clarify things. So, let’s move on and run the service…. Hence the different source value represented by the docker container hostname of the stream processing service instance. That’s it for this post. Stay tuned for more….